Mark Moyar, an acclaimed military historian, charts the rocky history of the America's Special Operations Forces, highlighting both the heroism of America's finest soldiers and the strategic limits of special operations. 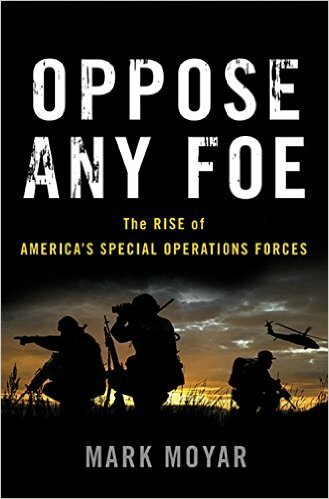 Oppose Any Foe is the epic story of America's most elite warriors: the Special Operations Forces. Weaving together their triumphs and tribulations, Moyar introduces a colorful cast of military men, brimming with exceptional talent, courage and selflessness. Presidents from Roosevelt to Obama have enthusiastically championed Special Operations Forces, although their enthusiasm has often surpassed their understanding of the limitations of these groups. Lacking clearly defined missions, Special Operations Forces have had to reinvent themselves time and again to prove their value in the face of fierce critics—many of them from the conventional military, which from the start opposed the segregation of talent and resources in distinct units. The first comprehensive history of these elite warriors and their courageous missions, Oppose Any Foe is fascinating reading for anyone interested in America's military history—and the future of warfare.